Weed of the week. Thanks to Adele Jones for the specimen. 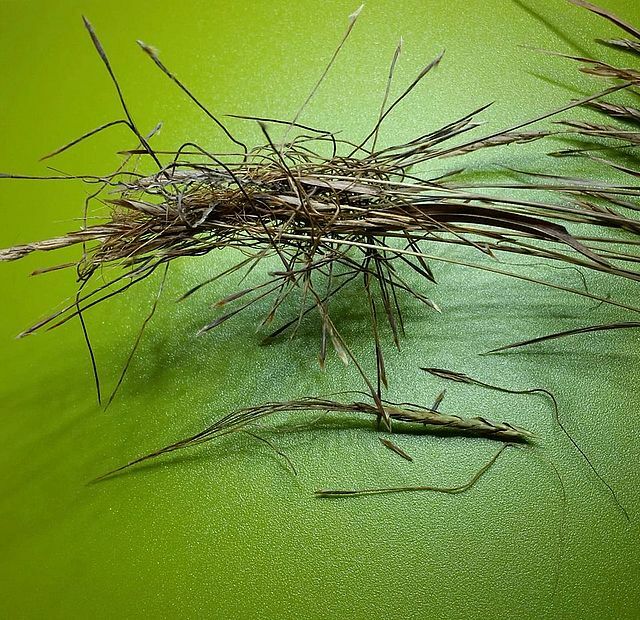 The photograph shows Heteropogon contortus (bunch speargrass/tanglehead), demonstating the feature giving it its common names. This species is a tall perennial grass, considered to be native to tropical and warm subtropical areas of Australia, Southern Africa, Southern Asia, and Southern United States. It is considered to be a weed on some areas because, although it can be a valuable pasture, the seeds are a serious problem for the wool industry. The seeds are sharp tipped and become embedded in the wool, devaluing the product. Seeds may work their way into the skin of sheep, leading to infection and even death. Cattle being short-haired, are not affected. The photograph shows that the two seeds freed from the bunch, have long, bent, hair-like awns. These are twisted and respond to changes in moisture by unwinding and turning the seed...hence the tangling within the seedhead and penetration of animal skin. When in contact with soil, this action twists the seed into the earth in a self-planting strategy!